BerryLan is an app for Raspberry Pi entry level fans. It’s a tool that helps you with the Raspberry WiFi setup. BerryLan is a software tool for Raspberry Pi entry level fans. It’s a tool that gives you a “headless” Raspberry Pi. By default, the Raspberry Pi is used like a computer, where you need a keyboard, mouse and monitor and in order to connect to the internet, you would also (initially) need an Ethernet Cable. 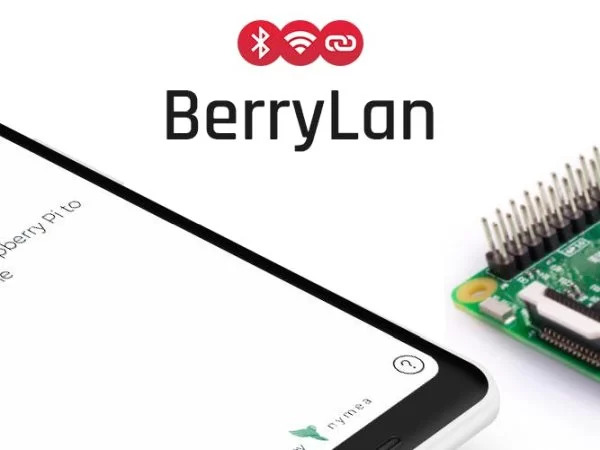 BerryLan removes those necessities by connecting to the Raspberry Pi using Bluetooth and establishes a connection to your WiFi Network in 3 easy steps. Check out the 1:30 long video, which shows the steps required! By default, the Raspbian image you get from Raspberry Pi is not meant for such method of connection. The way we managed to do that is by simply getting the latest Raspbian (the operating system of Raspberry Pi) release and we modify it a little bit – adding our network manager. You can check the exact modification we do on our github account here. In order for BerryLan to do it’s job, you would need to flash our modified Raspbian image to your SD Card. We advise you to use Etcher.io. You can download the image from our website. Insert the SD Card in your computer and open Etcher. After that, select our image (as shown in picture 1), select your SD Card, and then press the “Flash!” button. It should take around 5 minutes for the flash to complete. You can put your SD Card back into your Raspberry Pi and plug the power cord back in. BerryLan is available for all iOS (10.0.0 or later) and Android (4.1 Jellybean or later) devices. The app is completely (and will always be) free and open source. Once you have installed BerryLan on your smartphone, please make sure your Bluetooth is enabled on your phone, otherwise BerryLan will not be able to work. You will need to be physically near your Raspberry Pi. Open BerryLan. If you have completed all the steps successfully, you will see your Raspberry Pi in the list shown in Picture 1. BerryLan will now establish a connection to your RaspberryPi via Bluetooth. It should be a relatively quick process (a few seconds). Once a successful connection has been established, you will see a list of the available WiFi hotspots around you. In my case, I want to connect to the SSID “[email protected]” so I tap on it and I will need to enter my password. If the password you provide is correct (it has to be your WiFi password), BerryLan will give your Raspberry Pi access to your WiFi network and also give you your RaspberryPi’s local IP Address. From there, you can do anything you want! For example, you can SSH into it and start playing with your Raspberry Pi, or you can continue further with headless configuration and install a Remote View client on your Raspberry. Thank you for reading! If you have any issues, please leave a comment and I will get back to you. Please vote for this tutorial, if you liked it. READ Airplay Multiroom radio with the Raspberry Pi, no additional hardware needed.